I have been working on this tutorial for awhile and decided to get it together today because I have been getting a lot of coloring emails and questions. This quick tutorial is designed for those who are not quite comfortable with their Prismacolor Pencils YET or who would like some answers to basic questions. I am not a professional but I get results that I am happy with with little effort. Sometimes it is the little "tricks" that make such a difference. There are lots of tips and pointers throughout that may or may not help you. These are the things that help ME most and I am happy to share them with you. ****One of my favorite coloring techniques is mixing coloring tools---esp Prismacolor pencils and Copics...but for this tutorial--I only used Prismacolor pencils! 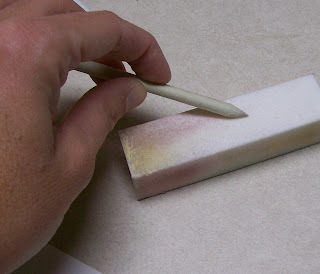 Then, start with the lightest color you will be using and outline the section to be colored. I used the flesh tone to outline her face, neck and arms. Just outline the image. 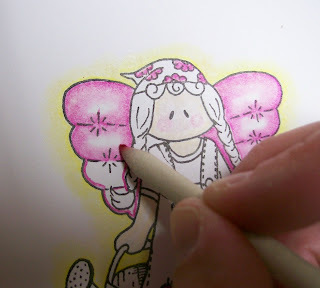 I added a bit of pink (just moved the pencil in a circle for this) to her cheeks! Then, dip the point in the odorless mineral spirits. (I am pretty liberal with this step. I make sure the whole tip absorbs the liquid.) Move the stump in clockwise circular movements pulling the color toward the middle of the image. This allows the darkest color to remain on the edge and creates a natural highlight in the center of the image. When the color stops moving, time to re-dip your stump! 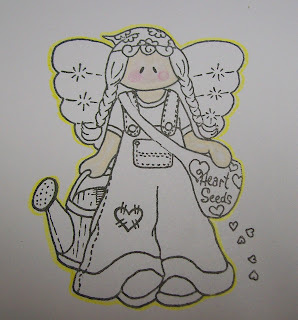 I wanted my angel to have an heavenly glow, so I took my yellow pencil and outlined the whole image in yellow. I chose to do this step next because if you are going to do some sort of shading with pencils on the outside, you want to do it before you color the image--esp if the color is lighter than the image! I used my blending stumps to move the yellow outward in small circles---this makes the color look like a glow! 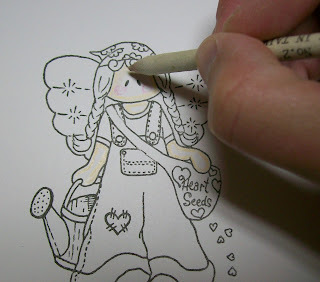 Next, I used my pink pencil and outlined all the parts of the image that I wanted pink. I colored the green sections and then outlined the jeans with blue. You can see how I added a bit more blue in the center of the legs because this part of the image is thick and I wanted to be sure that there wouldn't be too large of a highlight. 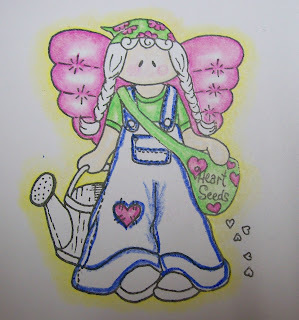 After blending the blue, I colored her hair, the watering can and her shoes. I added two shades of brown to the can to show you how you can even blend two shades to get an even more professional look. 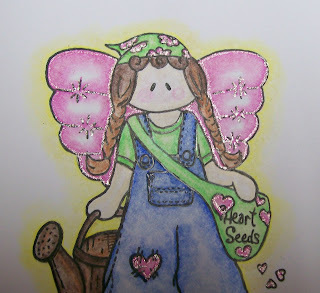 After I have the image as I like it, I chose to use my Sakura gellyroll pen to add some shimmer to the angel's wings and the hearts. I love the look this gives - a little bit of shimmer adds a lot! I hope you enjoyed this tutorial! Believe me, If I can color, SO CAN YOU! I would love to see what you create, so be sure to send me a link if you create a card using this tutorial! 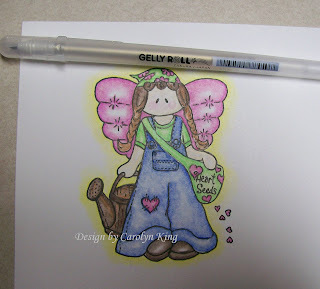 Materials used: Stamps-High Hopes; ink-brilliance black; cardstock-white, blue, celery (SU! 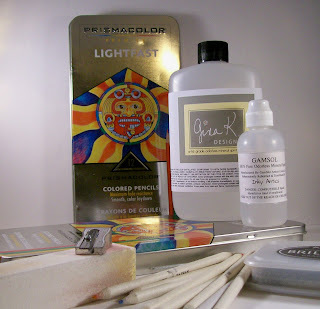 ); Designer paper by Basic Grey; Prismacolor pencils; odorless mineral spirits; blending stumps; sanding block; tab punch (SU! ); sakura stardust gellyroll pen; small circle punch (SU! ); silver brads (SU! ); flower; button; dimensionals (SU!). Coming next: another MFTeaser--ohhh..you're gonna love this one! 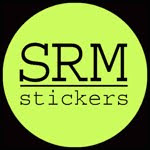 My Favorite Things is releasing two new stamp sets on Wednesday night right after the Cocktail party on Splitcoaststampers from 8-10 p.m central time. Thank you so much for the tutorial! Your instructions are so easy to follow and that card came out so beautifully! I am going to give this a try! Gorgeous Card! Fabulous tutorial! You rock! 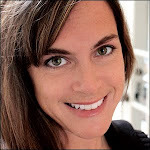 Carolyn, thanks so much for taking the time and effort to make this tutorial! I have been learning to color for eight years, and I still don't have it down perfectly. I will drag out my Prismas and try again; it has been over a year since they saw the light of day. 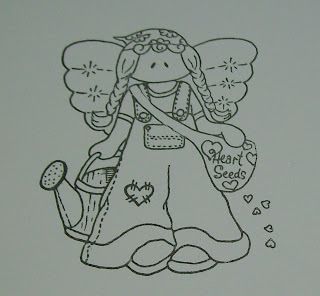 Your card was adorable, too-those High Hopes stamps are so cute! 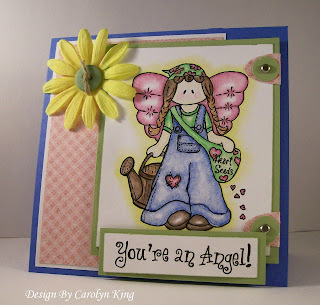 beautiful card...LOVE the image and the tutorial! Thanks!! I'm just getting the hang of these things so it's nice to read how others use them. Great tutorial! Do you ever have problems with fumes when you use the gamsol? Mine is suposed to be odorless, but I get a headache when I use it. Great tutorial Carolyn. I have a huge box of the Prismacolors, but no mineral spirits, so I NEVER use them..I will have to break down and buy some. Every time I go to Hobby Lobby, I forget to look...Great job!! okay, I really AM going to go open that bottle of mineral spirits udring naps this afternoon and finally take the prismaplunge! Thanks for the tips/inspiration! Gorgeous card!! Prisma pencils are my FAVE coloring medium!!! But I did just get my Copics.......LOLOL!!! Thanks for the tutorial Carolyn! I haven't coloured with Prismapencils for a little bit, and I love the look! Your colouring is fabulous!!! Thanks for sharing the great tutorial. GREAT tutorial, and adorable card!! You make it look so easy! Thanks for taking the time to post this. Your card is fantastic! Thanks, Cammie for your tutorial. I use the prisma pencils, but had no idea how to sharpen the stub. Love your work. Carolyn - Thank you so much for this great step by step tutorial! I'm looking forward to trying this! Wow, thank you so much. You make it look so easy and so lovely. Primsa pencils are my all time FAVORITE way to color. I am trying to branch out and learn new things...but I keep going back to my first love! Great tutorial! Thanks for taking the time ! Very nicely done Cammie! 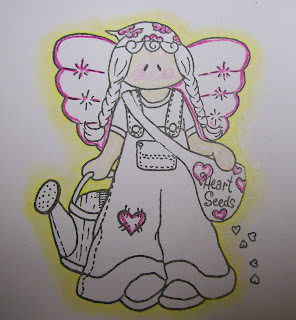 Your card was great....I love that little angel image! Good job! What a great tutorial! Thank you so much Carolyn! You covered some things that I was wondering about since I'm new to coloring with Prisma pencils. This card is beautiful! Luv the look with the gellyroll pen! Awesome tutorial! 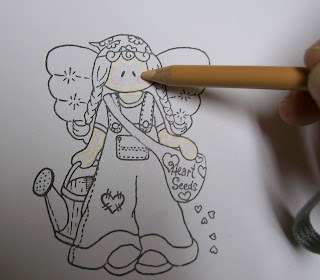 I am wondering though, I have the Stampin Up water color pencils and I use the blender pens, is it the same thing? I am sure I can color the same way but is the pencil similar, can I use Gamsol with the SU ones? Or should I dump them and get Prisma? Thanks so much! I'm so sorry Carolyn, I was trying to unsubscribe to one blog because I have too many to read in a day. I deleted ALL of mine by mistake. Your tutorial is wonderful! Nice clear photos and very good instructions. The card is adorable, I especially like the difference the Sakura pen made. TFS. 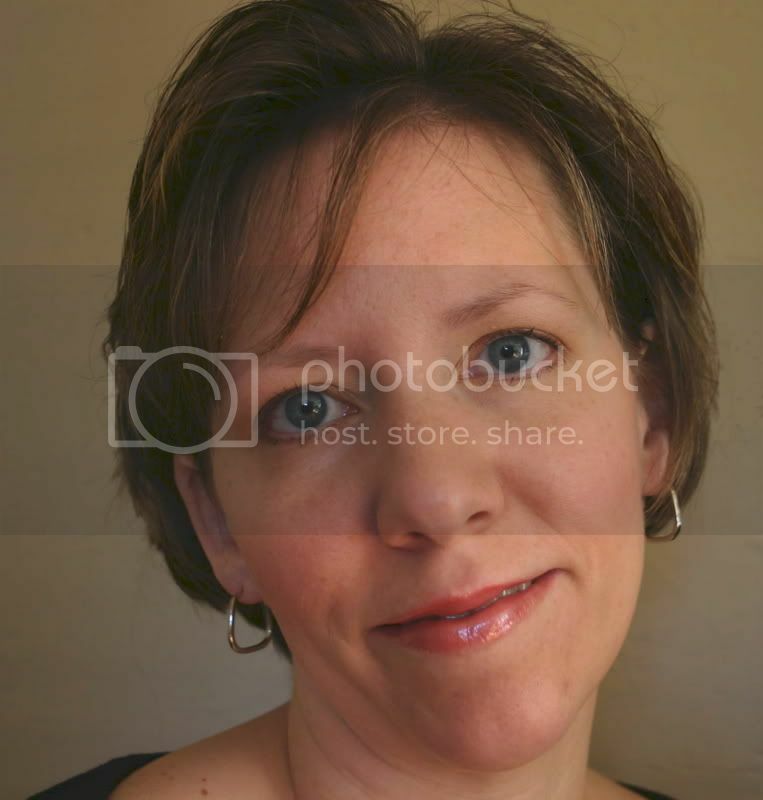 OMG Carolyn, this is a stunning tutorial, you did such a great job. Makes me want to break out my pencils tonight!!! Thanks so much for the tutorial, she is just adorable. Is it possible for Gamsol to lose it's effectiveness? I can't get my colors to stretch that far or blend that well and they used to, I think. I wish Michaels or AC Moore would sell the stuff in smaller quantities - I don't need a quart! 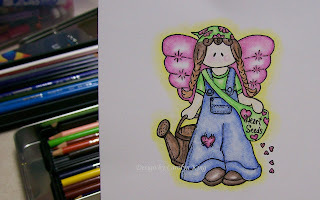 How fun this was to "watch" you create such a gorgeous card - and you make it look so easy! I don't have pencils, but will definitely have to try some! Thanks for sharing! GREAT tutorial! I love the step-by step, and seeing which blenders you like. I'm still trying them out and deciding what I like and what I don't--but this helps a lot! Thanks for sharing this! This was a wonderful tutorial, thank you for taking the time to do it! Your coloring is beautiful! Awesome tutorial, and your card is fabulous too!! all I can say is "WOW"!!! beautiful tutorial...can;t wait to do it!! love the card! Great tutorial. Thanks so much for sharing. Wow, great tutorial! Thanks so much for sharing that!!! Love how the card turned out, so cute. That is such a sweet card! I wondered how you got that look with the pencils. Thanks you so much! I need to go shopping! What a great instructional post !! Thanks !! I love my Prismacolor pencils but don't use them enough. Thanks so much !! Thank you for the tutorial, it was great. I copied it and put it in my Technique folder. I visit your blog every day, love it! A great place to learn and be inspired! Thank you Ms. Carolyn for this coloring tutorial... I know that I will be referring to this post often in my first attempts at coloring... I just need to get all of the right supplies now! Great tutorial and your card is adorable! Awesome tutorial Thank you Cammie! Great tutorial, simple, straightforward, clear presentation. Really good job, girl! 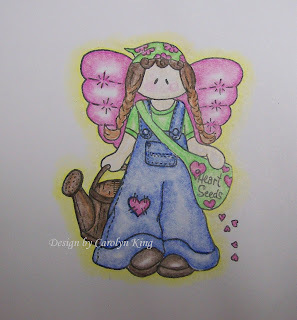 Thanks for using my angel design too! That was a really kind gesture on your part, as I know you could have used one of your own. Bless your heart! You are a Sweetie! This is just gorgeous, Carolyn! Fabulous tutorial too! I miss my Prismacolors. . .haven't used them in a while. Great tutorial...Thanks!! Now can you do that on video?, lol! Thank you for a wonderful tutorial! It was very helpful in figuring out how to colour effectively! Very easy to follow your tutorial. Very cute stamp and card! Okay, now that I've actually gone and tried this I want to thank you again for the tutorial! :-) I had almost given up on coloring and now I'm loving it!! It's like a new found love! Okay, thanks again! Hope you have a great Thanksgiving filled with lots of tastiness! I've finally found a blog that uses prisma pencils. Love the coloring you did on the card and thanks for showing your technique. This is my first visit to your blog. I came here through to see the cards the DT made for Gina's Birthday, and I also saw your tutorials. Thank you so much for giving this tutorial. You're very talented...not only in coloring, but also, in teaching. You make it look so easy. I'm a beginner, but praying my enthusiasm will help me along, speedily. I create my own drawings/picture, and have been using colored pencils on them. It's not enough. That's why I was searching, and I'm so thankful I was lead to you. Again, thank you for sharing your GOD-given talents.